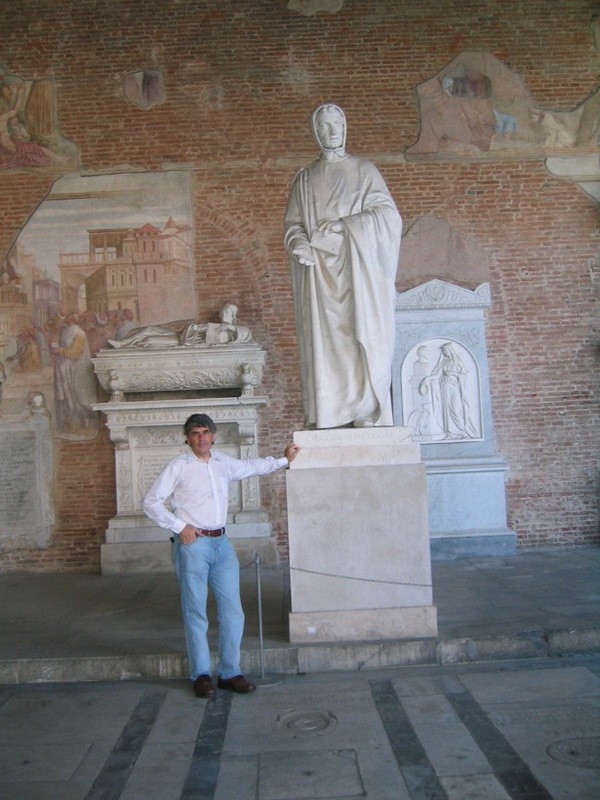 statue of Leonardo Fibonacci in 2002. In 1983, I did something that would turn out to have a significant influence on the direction my career would take. Frustrated by the lack of coverage of mathematics in the weekly science section of my newspaper of choice, The Guardian, I wrote a short article about mathematics and sent it to the science editor. A few days later, the editor phoned me to explain why he could not to publish it. “But,” he said, “I like your style. You seem to have a real knack for explaining difficult ideas in a way ordinary people can understand.” He encouraged me to try again, and my second attempt was published in the newspaper on May 12, 1983. Several more pieces also made it into print over the next few months, eliciting some appreciative letters to the editor. As a result, when The Guardian launched a weekly, personal computing page later that year, it included my new, twice-monthly column MicroMaths. The column ran without interruption until 1989, when my two-year visit to Stanford University in California turned into a permanent move to the US. Before long, a major publisher contracted me to publish a collection of my MicroMaths articles, which I did, and following that Penguin asked me to write a more substantial book on mathematics for a general audience. That book, Mathematics: The NewGolden Age, was first published in 1987, the year I moved to America. In addition to writing for a general audience, I began to give lectures to lay audiences, and started to make occasional appearances on radio and television. 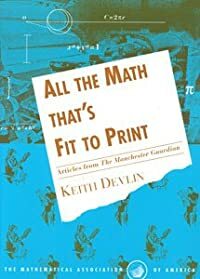 From 1991 to 1997, I edited MAA FOCUS, the monthly magazine of the Mathematical Association of America, and since January 1996 I have written this monthly Devlin’s Angle column. In 1994, I also became the NPR Math Guy, as I describe in my latest article in the Huffington Post. Each new step I took into the world of “science outreach” brought me further pleasure, as more and more people came up to me after a talk or wrote or emailed me after reading an article I had written or hearing me on the radio. They would tell me they found my words inspiring, challenging, thought-provoking, or enjoyable. Parents, teachers, housewives, business people, and retired people would thank me for awakening in them an interest and a new appreciation of a subject they had long ago given up as being either dull and boring or else beyond their understanding. I came to realize that I was touching people’s lives, opening their eyes to the marvelous world of mathematics. In taking mathematical ideas developed by others and explaining them in a way that the layperson can understand, I was following in the footsteps of others who had also made efforts to organize and communicate mathematical ideas to people outside the discipline. Among that very tiny subgroup of mathematics communicators, the two who I regarded as the greatest and most influential mathematical expositors of all time are Euclid and Leonardo Fibonacci. Each wrote a mammoth book that influenced the way mathematics developed, and with it society as a whole. Euclid’s classic work Elements presented ancient Greek geometry and number theory in such a well-organized and understandable way that even today some instructors use it as a textbook. It is not known if any of the results or proofs Euclid describes in the book are his, although it is reasonable to assume that some are, maybe even many. What makes Elements such a great and hugely influential work, however, is the way Euclid organized and presented the material. He made such a good job of it that his text has formed the basis of school geometry teaching ever since. Present day high school geometry texts still follow Elements fairly closely, and translations of the original remain in print. 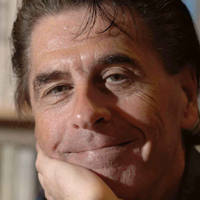 With geometry being an obligatory part of the school mathematics curriculum until a few years ago, most people have been exposed to Euclid’s teaching during their childhood, and many recognize his name and that of his great book. In contrast, Leonardo of Pisa (aka Fibonnaci) and his book Liber abbaci are much less well known. Yet their impact on present-day life is far greater. Liber abbaci was the first comprehensive book on modern practical arithmetic in the western world. While few of us ever use geometry, people all over the world make daily use of the methods of arithmetic that Leonardo described in Liber abbaci. In contrast to the widespread availability of the original Euclid’s Elements, the only version of Leonardo’s Liber abbaci we can read today is a second edition he completed in 1228, not his original 1202 text. Moreover, there is just one translation from the original Latin, in English, published as recently as 2002. But for all its rarity, Liber abbaci is an impressive work. Although its great fame rests on its treatment of Hindu-Arabic arithmetic, it is a mathematically solid book that covers not just arithmetic, but the beginnings of algebra and some applied mathematics, all firmly based on the theoretical foundations of Euclid’s mathematics. After completing the first edition of Liber abbaci, Leonardo wrote several other mathematics books, his writing making him something of a celebrity throughout Italy—on one occasion he was summonsed to an audience with the Emperor Frederick II. Yet very little was written about his life. In 2001, I decided to embark on a quest to try to collect together what little was known about him and bring his story to a wider audience. My motivation? I saw in Leonardo someone who, like me, devoted a lot of time and effort trying to make the mathematics of the day accessible to the world at large. (Known today as “mathematical outreach,” very few mathematicians engage in that activity.) He was the giant whose footsteps I had been following. I was not at all sure I could succeed. Over the years, I had built up a good reputation as an expositor of mathematics, but a book on Leonardo would be something new. I would have to become something of an archival scholar, trying to make sense of Thirteenth Century Latin manuscripts. I was definitely stepping outside my comfort zone. The dearth of hard information about Leonardo in the historical record meant that a traditional biography was impossible—which is probably why no medieval historian had written one. To tell my story, I would have to rely heavily on the mathematical thread that connects today’s world to that of Leonardo—an approach unique to mathematics, made possible by the timeless nature of the discipline. Even so, it would be a stretch. In the end, I got lucky. Very lucky. And not just once, but several times. As a result of all that good fortune, when my historical account The Man of Numbers: Fibonacci’s Arithmetic Revolution was published in 2011, I was able to compensate for the unavoidable paucity of information about Leonardo’s life with the first-ever account of the seminal discovery showing that my medieval role-model expositor had indeed played the pivotal role in creating the modern world that most historians had hypothesized. With my Leonardo project such a new and unfamiliar genre, I decided from the start to keep a diary of my progress. Not just my findings, but also my experiences, the project's highs and lows, the false starts and disappointments, the tragedies and unexpected turns, the immense thrill of holding in my hands seminal manuscripts written in the thirteenth and fourteenth centuries, and one or two truly hilarious episodes. I also encountered, and made diary entries capturing my interactions with, a number of remarkable individuals who, each for their own reasons, had become fascinated by Fibonacci—the Yale professor who traced modern finance back to Fibonacci, the Italian historian who made the crucial archival discovery that brought together all the threads of Fibonacci's astonishing story, and the remarkable widow of the man who died shortly after completing the world’s first, and only, modern language translation of Liber abbaci, who went to heroic lengths to rescue his manuscript and see it safely into print. 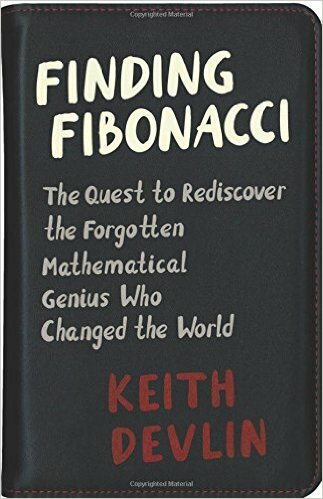 This post is adapted from the introduction of Keith Devlin’s new book Finding Fibonacci: The Quest to Rediscover the Forgotten Mathematical Genius Who Changed the World, published this month by Princeton University Press.